Business acumen? Grammar is what I’m worried about, Lord Sugar. We know how it works. The premise is simple. Round up fifteen or so ‘business people’ and put them in front of Lord ‘Bongo Drums’ Sugar. They must have vague job titles which include the words ‘global’ ‘brand’ and ‘manager’ (in fact, there’s one right there). They must have faces you wouldn’t tire of driving the pointy end of a trowel into. Their clothes must be as pretentious and outlandish as their claims of business grandeur. Lastly, they must be unquestionably, astronomically, biblically, stupendously thick. 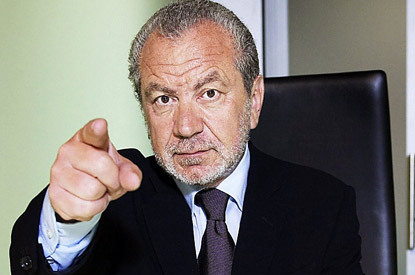 With that criteria met, you have the next series of The Apprentice ready for the off. And last night’s first episode didn’t disappoint. Handed £250 by Mr Amstrad, they were instructed to invest it in fruit and veg. They were then told, in no uncertain terms, to come back with more than £250. The boys team very quickly bought 1,400 oranges – clearly a little overexcited and confused by the start-up capital with which they had been trusted. The plan was to turn the oranges into fresh juice for London’s busy morning commuters. Great idea, if only they could have squeezed the juice out of more than four of them. The other fly in the ointment was that they’d left themselves with just £40 for their lunch menu which, after five seconds of deliberation, they decided to invest in soup ingredients. The fact none of them knew how to make soup was quickly glossed over. The girls, on the other hand, decided to sell a mixed fruit cocktail for breakfast and a vegetable pasta for lunch. They won, obviously. But it was during their frenzied selling task that the true horror of what the economy is up against was revealed. “How do you spell vegetable?” Asked one of the contestants, kneeling down at the menu board, piece of white chalk in hand. An answer never materialised, leaving us to assume that her fellow members of the business elite were similarly perplexed. She shrugged and proceeded to scrawl ‘Vegatable Soup’ on the board. And therein lies our problem, folks. Putting the contestants of this brilliant program to one side, I am inundated daily with email from respectable companies, customers and partners displaying a shocking disregard for our wonderful English language. Poor grammar and spelling litters correspondence from people who really should know better and I have had enough, quite frankly. If you can’t be bothered to proof read written correspondence before sending it – particularly when software such as Microsoft Word makes it nearly impossible for you to misspell a word or start a sentence without a capital letter – you don’t deserve to have a meaningful job title. I’m not entirely convinced you even deserve to breathe. I’m not the greatest speller in the world, nor am I a literary genius (go on, trawl this post looking for grammatical errors – there’ll be plenty), but I do take pride in any sentence I write. I take even more pride in ensuring it will be read and digested as intended. When emailing customers or colleagues, that pride is amplified tenfold. Maybe I’m old fashioned. Perhaps in the new world of instant messaging, it is less of an issue. ‘Txt spk’, while interminably irritating, unfathomable and difficult to type, is now as prevalent in business as it is between friends. Perhaps I just need to get with the kids and LOL it off. Or maybe not. Trust me, if this continues, we’ll never see the back of this economic slump. I take very few illiterate people seriously and I fear those in my camp are of a similar disposition. Economic output won’t increase meaningfully until we can all start to communicate effectively and the ability to string a sentence together is at the very heart of that. Sorry, Alan, but I don’t envy your task. Man up. Start a fire.